Hi. My name is Wendy. 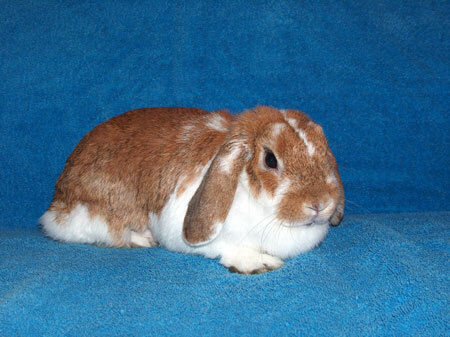 I am a very pretty, outgoing and friendly 3-4 year old mini-lop girl. I get very happy and excited when people visit me and run over to stand on my hind legs and say hello. I would love to find a home very soon, because I have so much love to share with you. I was originally listed as a special needs bunny, because I had a malocclusion with my front teeth I had to have them surgically removed. The teeth were too misaligned just to be filed down, and in order for me to eat and take care of myself, this dental procedure was needed. Now, I am almost like any other rabbit. I can still eat just fine, but if you give me a small piece or carrot or some types of food, you'll need to shred them for me. So, now I am ready to be adopted and my adoption will be $150, which is higher than usual, to help offset my medical expenses. SaveABunny actually needs to raise about $500 for my dental surgery, so if you would like to make a donation to help me, we'd all be very grateful. The ability to help rescue special needs bunnies like me really relies on the generosity of people like you. Donations of $50 or more receive free SaveABunny membership and a beautiful color certificate. More importantly, you will know that you have helped to save and improve the lives of loving rabbits, like me, who would otherwise be euthanized. If you would like to help me by making a donation to help pay for my medical expenses, it would really help me and also allow SaveABunny to help other rabbits in need. Thanks and I hope to meet you soon!